CCGI webinars and learning modules are presented in collaboration with CMCC Continuing Education and are hosted on the CMCC CE Connect website. There is no charge to register and registrants have access to this material for a period of one year from the date of registration. Free continuing education hours may be available for CCGI courses. Contact your local CE board to find out more. If you have questions about CCGI educational courses, please contact us. 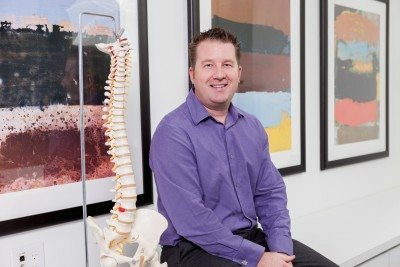 Listen to our 1-hour webinar on the Treatment of Neck Pain Associated and Whiplash Associated Disorders with Dr. Joel Weisberg, Dr. David Whitty and Dr. André Bussières. Find out more about the newly published guideline and learn how to apply the recommendations in clinical practice. 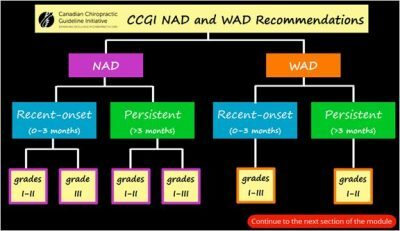 This 30-minute interactive module includes tools for practitioners such as algorithms, exercise videos and useful links to other valuable resources on the treatment of neck pain associated and whiplash associated disorders. There is a short quiz at the end to test your knowledge. This 30-minute interactive educational module is designed to help you put evidence-informed practice into your day-to-day clinical work. It includes video clips, case studies and useful hyperlinks to websites and other valuable resources on guidelines and best practices. There is a short quiz at the end to test your knowledge. The module will help you understand why EIP is good for both you and your patients. The Brief Action Planning Online Module is a 22-minute interactive module including video clips of a simulated clinician and patient encounter, to help you apply material learned on self-management and brief action planning. Created in collaboration with the Centre for Collaboration, Motivation and Innovation (CCMI), this module introduces learners to the 'Ask-tell-ask' process, the behavioural action plan and problem-solving techniques. Click here to watch a short video on how to access the Brief Action Planning online module through CMCC Connect. N.B. All course components including the three webinars, the online module and the evaluation survey must be completed to receive your personal certificate of completion for 4 CE hours. 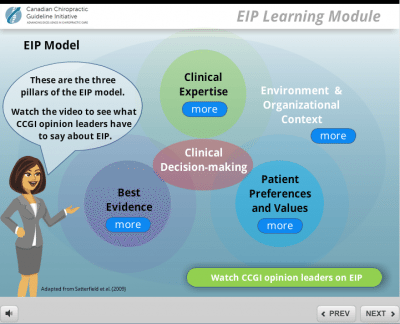 There are two CCGI clinical vignettes accompanying Webinar 2: Neck Pain Guideline 2014. The clinical vignettes can be found on SurveyMonkey at: Clinical Vignette 1 and Clinical Vignette 2. A Certificate of Completion with 1 credit hour will be awarded when both Clinical Vignettes are successfully completed. These modules from the University of Minnesota consist of three 20-40 minute courses. Ask your regulatory board for approval of CE hours. If the above links to the University of Minnesota modules, do not function, or to learn more about other Evidence Informed Practice topics, please access the modules through University of Minnesota: Foundations of Evidence Informed Practice site.